Prepare the marinade the night before: Combine 1/3 of the chopped green onions, 1/3 of the garlic, and season with 1 teaspoon cumin and 1 packet of sazon (1 teaspoon). Rub this mixture all over both the chicken and ribs. Place the chicken in a plastic baggie and the pork in a separate plastic baggie. 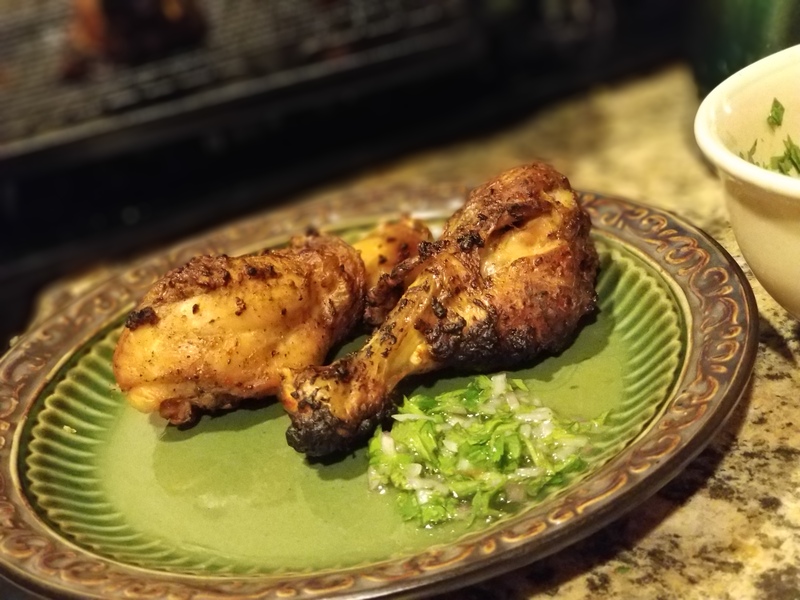 Allow to marinate in the refrigerator overnight. Roast chicken and pork at 350 degrees F until cooked through, about 25-30 minutes. Let cool, then remove the bones and shred, or cut, both meats into large pieces. Make the hogao: Heat a skillet over medium heat. Add the tomatoes, 1/3 of the green onions, 1/3 of the garlic, 1 teaspoon cumin, 1/2 packet of sazon (1/2 teaspoon), 1/3 of the cilantro, and salt to taste. 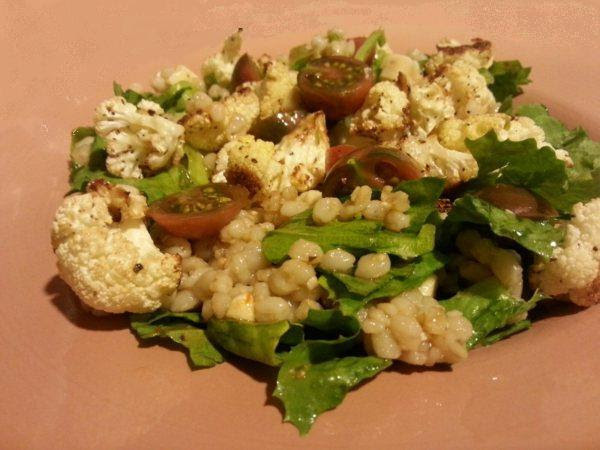 Saute until the tomatoes are soft and “mushy.” Most of the liquid will have evaporated. 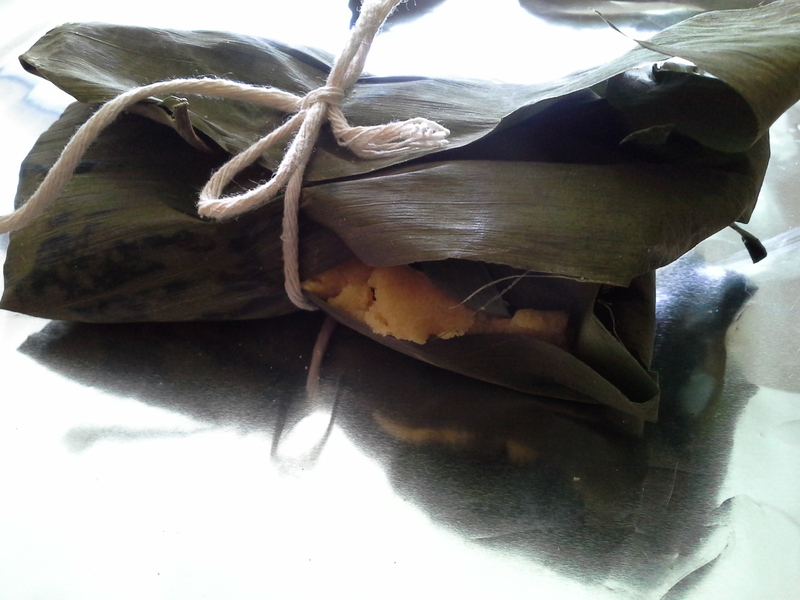 Refrigerate until ready to assemble tamales. 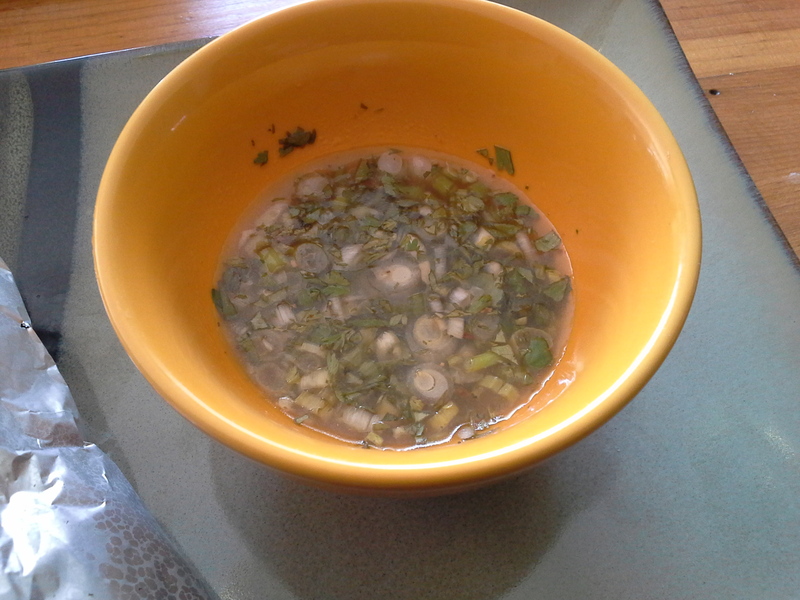 To make the pique salsa: In a small bowl, combine remaining green onions, garlic, cilantro, sugar, vinegar, lemon juice, then season with salt, if desired. 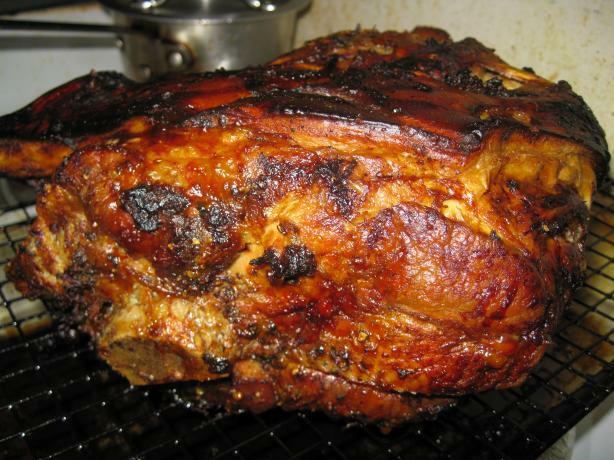 Try to allow about 2 hours for the flavors to develop fully. 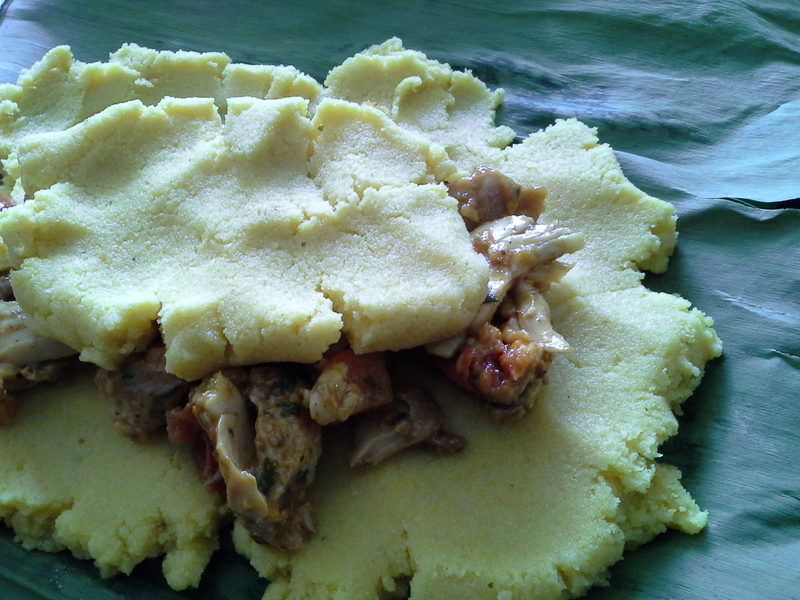 Prepare the masa: Prepare the masarepa according to package directions, but use chicken broth and a little salt. 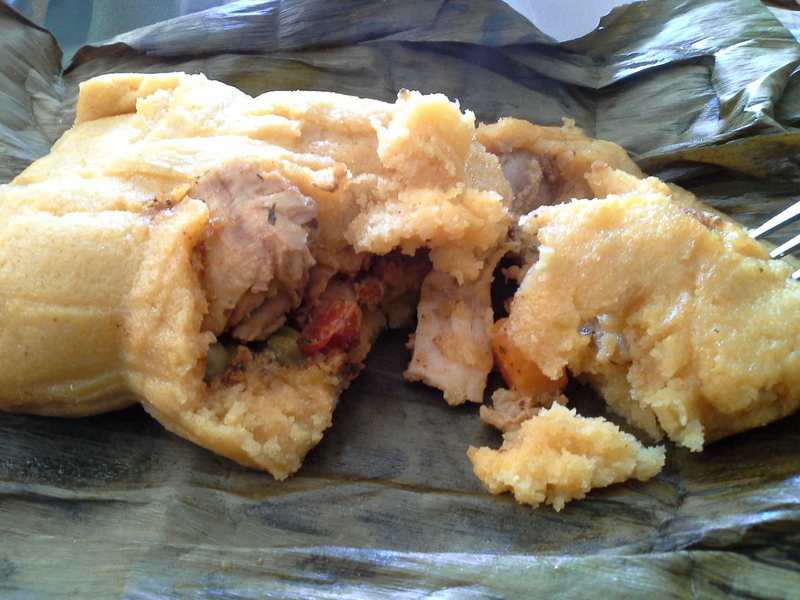 This is the best part of the tamale according to my husband, so it should taste good! It should form into a dough that stays together when squeezed in your palm. If it is too wet, you can still use it, but it will be more messy to work with (I just use a little more masarepa to thicken it up). Assembly: In a large bowl, combine shredded meat, peas and carrots, red potatoes, and hogao. 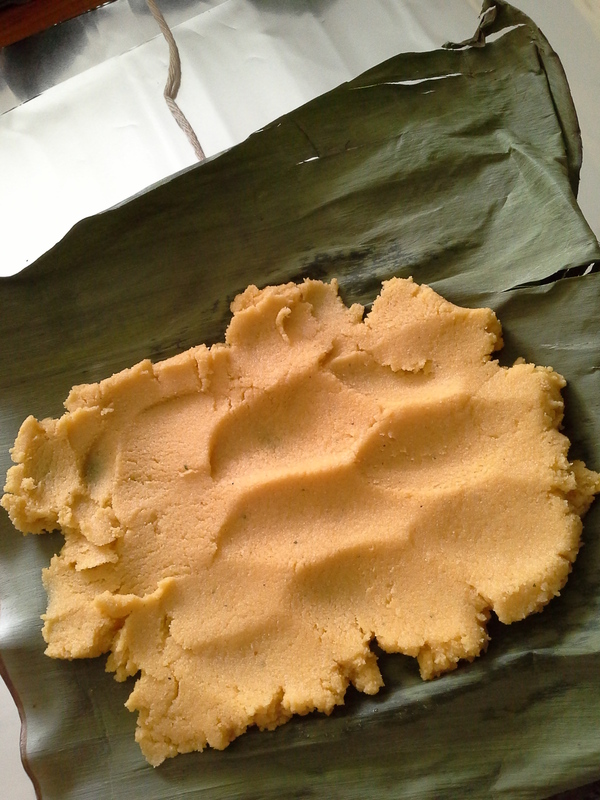 This will be the filling for the masa. Some people think making the packets is the hardest part, but really the only hard thing is to cut the string to the right size to fit around your tamale. 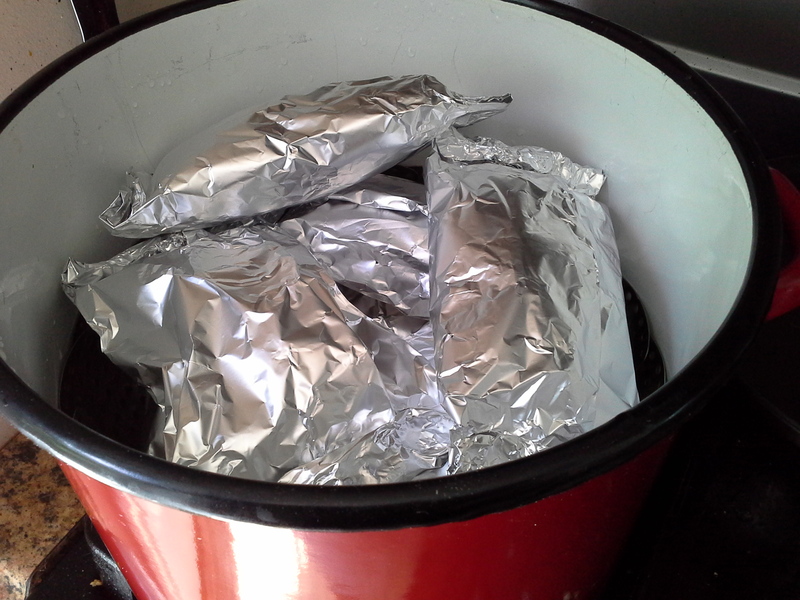 When I made my first batch, I tended to make the bundles too large. 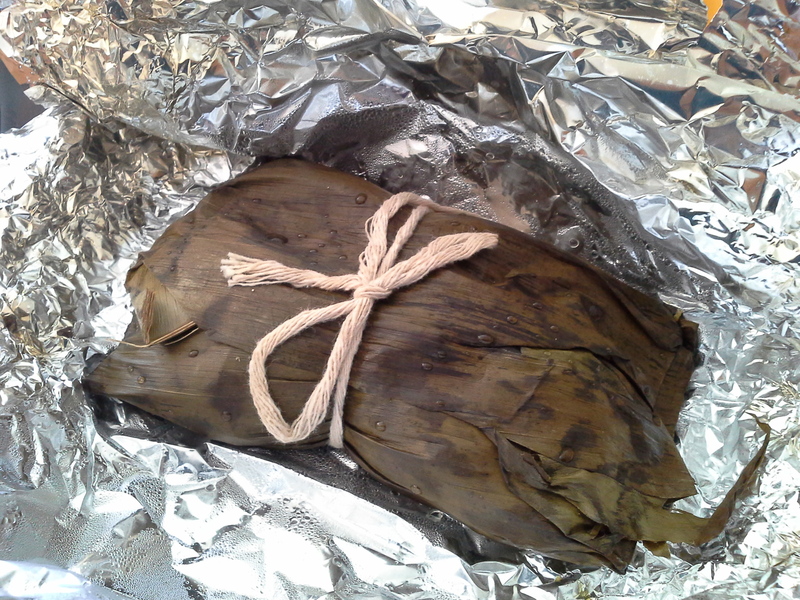 Also, many people say to use 2 banana leaves, criss-crossed. This is not really necessary since you will be wrapping the whole thing in aluminum foil. Don’t stress. Cut your banana leaves into squares, approximately 12-inches. Cut some aluminum foil a little larger. The string is about 18-inches or so. 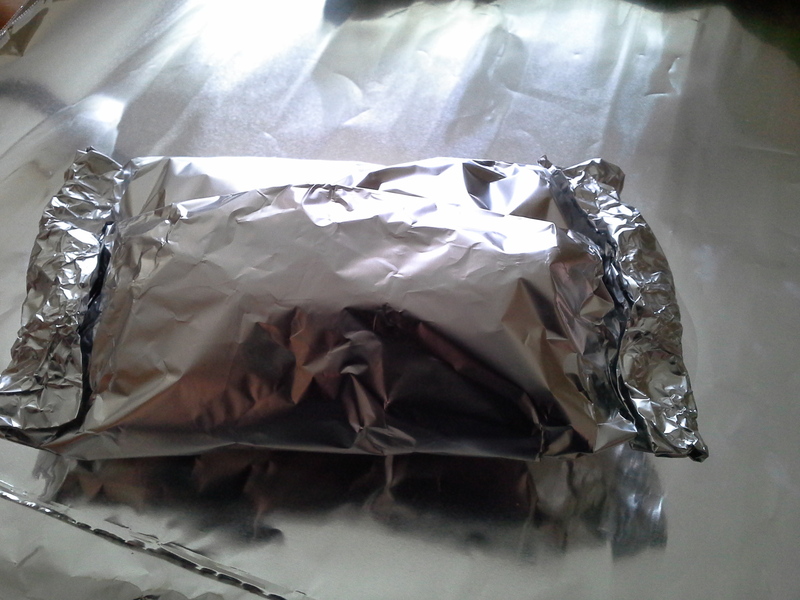 Lay a sheet of foil on a work surface. Stretch the string across the shorter side. 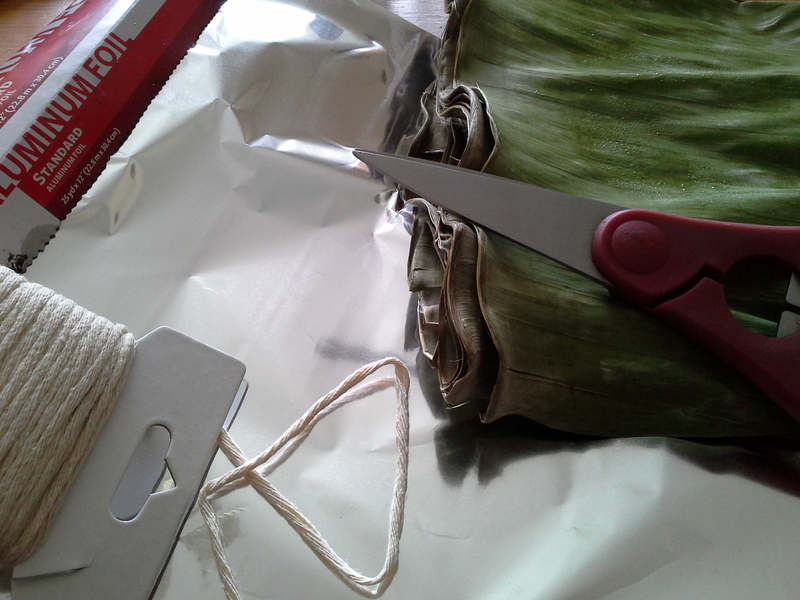 Lay a banana leaf on the foil and string with the “grain” of the leaves perpendicular to the string. 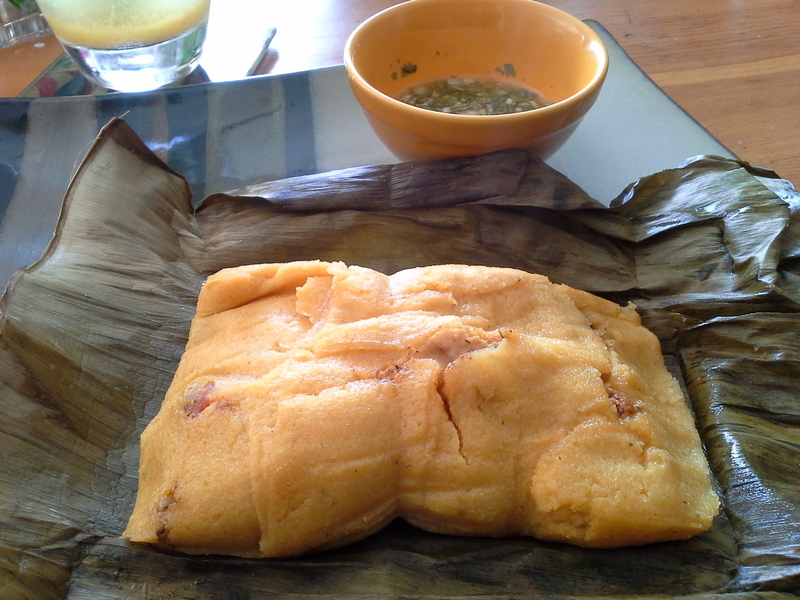 Spread 2-3 large heaping tablespoons of the masa on the banana leaf and spread out to about a inch from the edge. 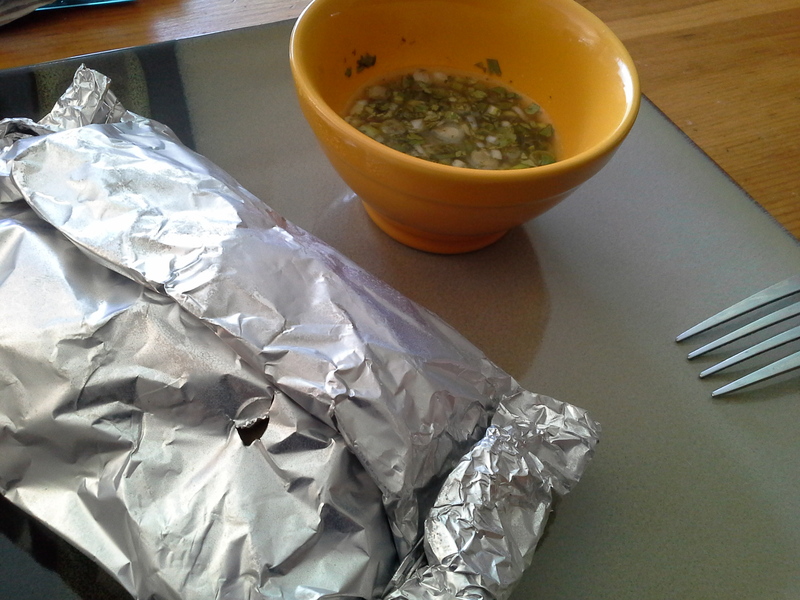 Place 2 regular heaping tablespoons of the meat filling down the middle of the masa. If you are using the eggs, lay them on top of the filling. Take another heaping tablespoon of the masa and form it into a little log, flatten a little, and place that on top of the filling. 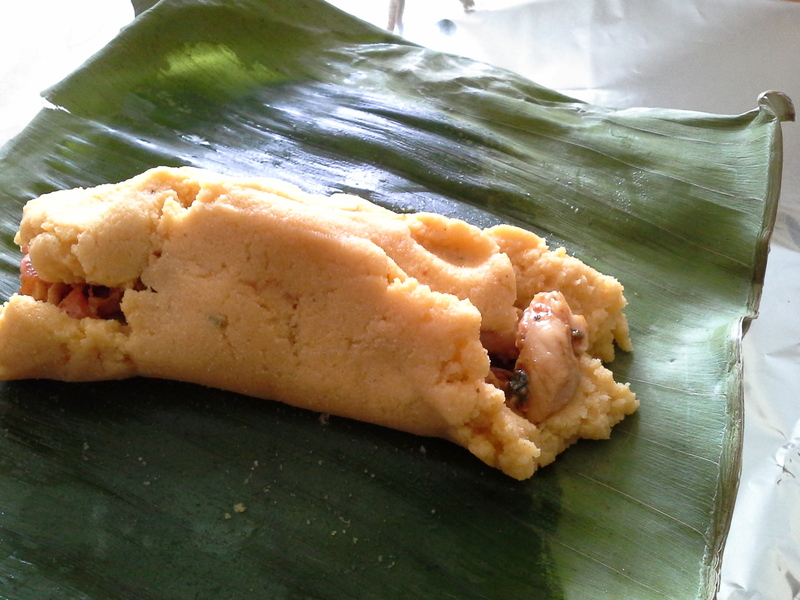 Now grab the two long sides of the banana leaf and sort of squish the tamale and the masa will sort of surround the filling. Lay the sides down and fold up the two other ends, then fold the long ends over to form a packet. Tie the string into a pretty bow and that’s it! Just seal the packet in the foil and you are done with the first one. 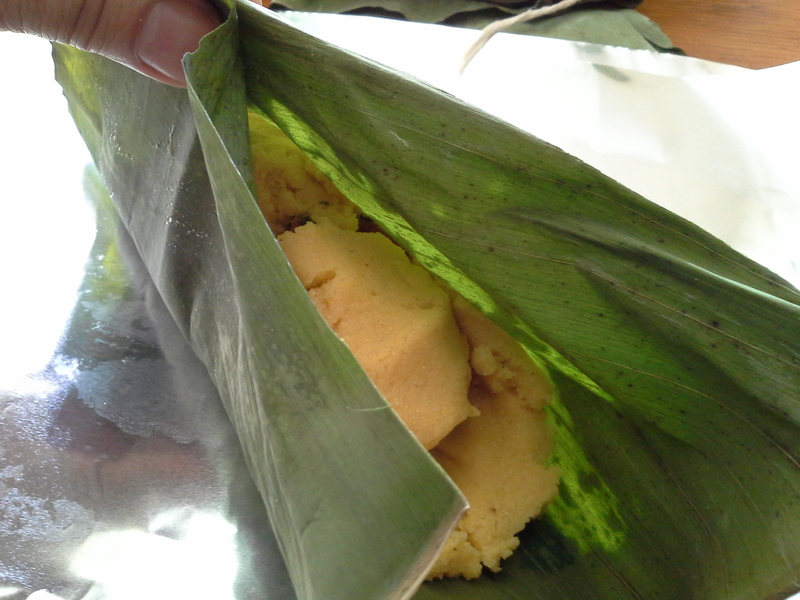 It is okay if the banana leaf has a little tear since you will be wrapping them in aluminum foil anyway. 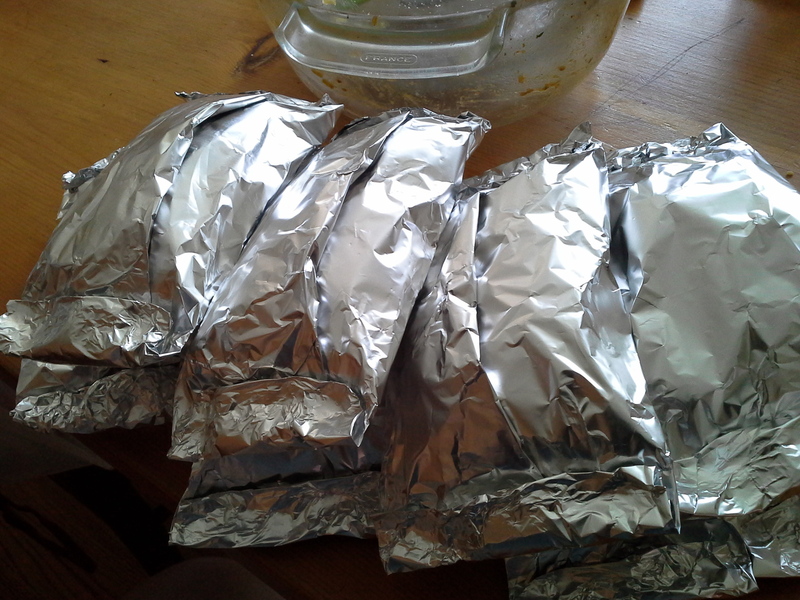 Once you prepare all the packets, you will steam them for an hour so that the masa cooks. I use a deep stockpot and a steamer insert. The packets should not be submerged in the water. 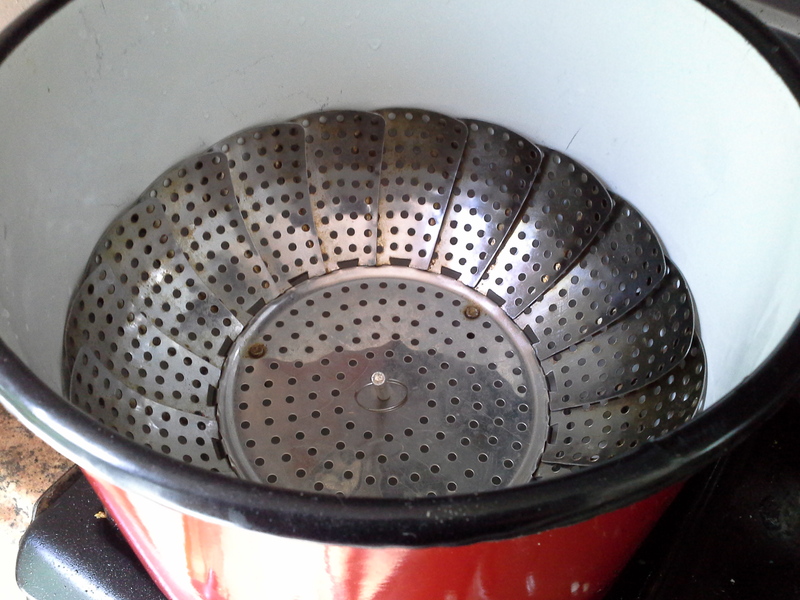 You can also crumble up some foil and place that in the bottom of your pot instead of using a steamer insert. 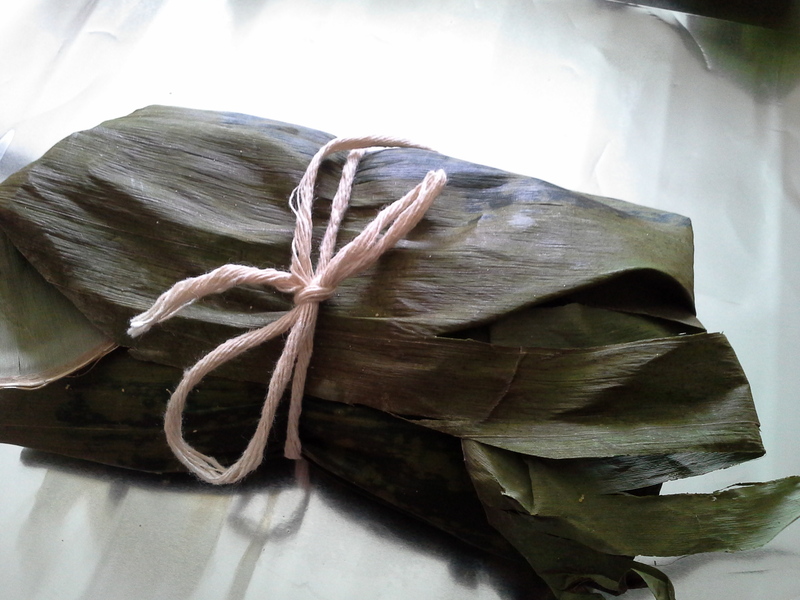 Once cooked, remove the foil and serve the tamales in the banana leaves. 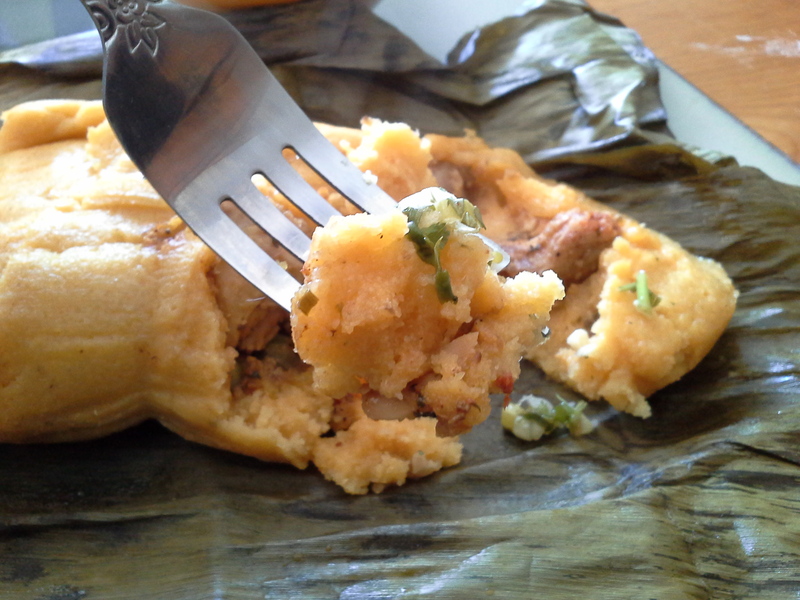 Pass the pique to drizzle over the tamales.